A U.S. naval vessel intercepted a large Iranian weapons shipment, seizing massive quantities of arms and sophisticated weaponry destined for Yemen, the Pentagon announced Monday. The seizure occurred in the Arabian Sea on March 28, officials said, marking the third interception of an Iranian weapons shipment in recent weeks. 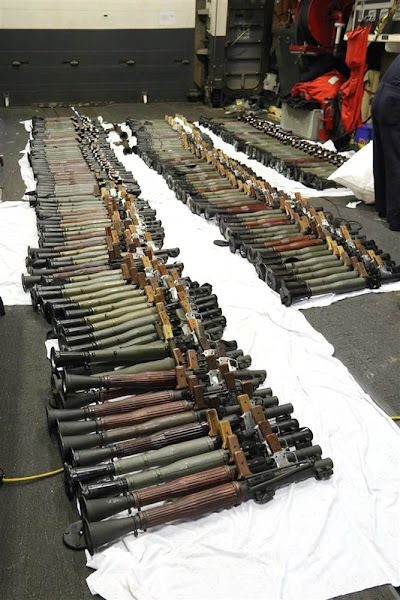 The ship was carrying 1,500 AK-47 rifles, 200 rocket-propelled grenade launchers, and 21 .50-caliber machine guns. They were en route to Houthi insurgents battling in Yemen's civil war at Iran's behest. The U.S. Navy let the crew go after seizing the weapons, in line with current rules of engagement, according to a U.S. official speaking with Fox News. This incident marks another major development in a string of recent Iranian provocations, indicating growing belligerence among the Islamic Republic's decision makers. Last month, Iran tested missiles in violation of a United Nations Security Council resolution associated with the nuclear deal, which prohibits Iran from developing its ballistic missile program for eight years. Iran also continues to expand its presence throughout the Middle East in line with its regional hegemonic ambitions. On Monday, Iranian General Ali Arasteh said that the Islamic Republic deployed special forces to Syria as "advisers." Last month, Arasteh revealed that Iran may deploy commandos and snipers from its regular armed forces as military advisers in Iraq and Syria. Iran expert Ali Alfoneh told the Jerusalem Post that "the regular army has begged for some time to get involved in Syria because it would be a source of prestige and funding." The deployment indicates a shift in the army's constitutional mission focused on ensuring Iran's territorial integrity, writes Iran expert Amir Toumaj of The Long War Journal. These developments support critics of the nuclear deal who argue that financial sanctions relief emboldens Iran to increase its sponsorship of terrorism throughout the region and worldwide. Read more at Investigative Project.